Senior partner Ercüment Erdem founded the Istanbul-based firm 30 years ago and leads its dispute resolution practice. It’s on his name that the firm’s reputation in this field largely rests. Erdem often sits as an arbitrator in ICC cases and at institutions in Switzerland, Russia and Iran, as well as the new Istanbul Arbitration Centre. He became a member of the ICC Court in 2016. Although Erdem is the only member of the practice with an international profile, partners Piraye Erdem and Süleyman Sevinç combine international arbitration with commercial litigation experience. The firm is tight-lipped about its clients but is known to have acted for Turkey’s Yildirim conglomerate, Enerji Holdings, and glass and chemicals company Şişecam. It has acted in two cases for Turkish Super League football clubs, including one for Istanbul’s Galatasaray before the Court of Arbitration for Sport in Lausanne. Erdem & Erdem represented Yildirim in a US$125 million ICC case against CCX, a mining company linked to Brazilian tycoon Eike Batista. When a planned sale of coal assets in Colombia stalled, Erdem & Erdem helped Yildirim obtain emergency arbitrator relief to prevent CCX from engaging in talks with other buyers. The dispute ended in 2016 with CCX agreeing to sell the assets to Yildirim for US$45 million. The firm has also been acting for a Turkish oil and gas distributor in a dispute heard under Swiss rules, and represented the claimant in one of the first cases at the Istanbul Chamber of Commerce Arbitration Centre, which ended in a settlement. It has also appeared in cases at the Izmir Chamber of Commerce and the Union of Chambers and Commodities Exchanges of Turkey (TOBB). The firm has been instructed in a €60 million dispute between a Turkish energy company and its Italian supplier. After winning enforcement of a US$65 million ICC award in a Turkish first-instance court, the firm is defending that judgment on appeal before the country’s Court of Cassation. The firm is representing a Turkish energy company in a US$60 million suit against its Italian supplier; the hearing is scheduled for mid-December. Atilla Basol, CEO of Turkey’s Enerji Holdings, had occasion to use the firm for a high-value ICC dispute over equipment supplies for an important project. “Over our many years of experience in various ICC arbitrations, we can easily rank Erdem & Erdem as the number one law firm for ICC arbitration based in Turkey,” he says. Ercument Erdem in particular is “one of the best lawyers we have ever worked with during our business life”, Basol adds. Özcan Günergök, legal director at Şişecam, retained the firm for an ICC dispute with a foreign distributor concerning unpaid invoices. He says Ercument Erdem gave an “impressive” performance at the hearings in Zurich, while Piraye Erdem and Süleyman Sevinç were also “highly knowledgeable, responsive and focused on our needs”. Petek Arslan of football club Galatasaray engaged Erdem & Erdem for the CAS case mentioned above as well as an ICC case over a sponsorship agreement, both of which successfully settled. He calls the firm “reliable and good value” and commends their “practical and business-minded” advocacy. Associate Ezgi Babur von Schwander demonstrated impressive knowledge of international arbitration, he adds. 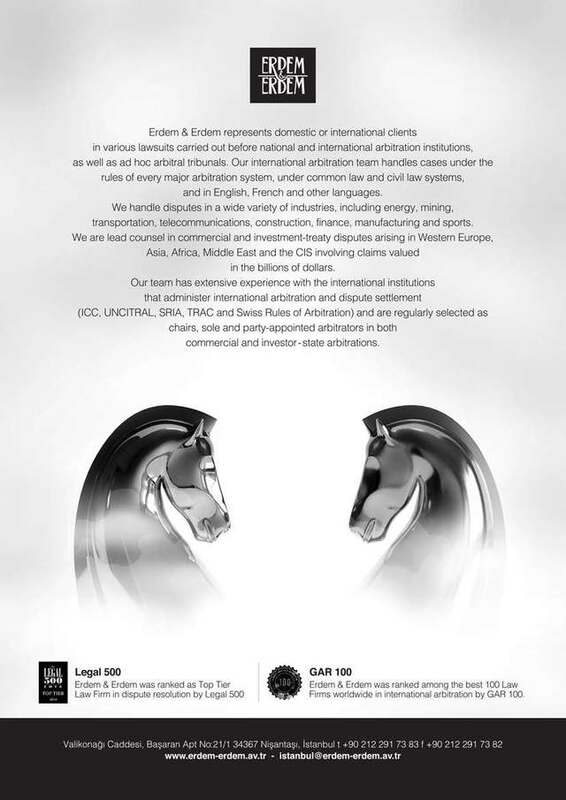 Since its foundation 30 years ago, Erdem&Erdem has pioneered and introduced international arbitration practice and worked the making of international arbitration legislation in Turkey. The arbitration team handles domestic and international cases under the rules of every major arbitration system, under common law and civil law systems. Our lawyers represent clients in disputes across a wide variety of industries including construction, energy, M&A/joint venture disputes, mining, real estate, manufacturing, transportation, telecommunications and sports as lead counsel or arbitrators in Western Europe, Asia, Africa, Middle East and the CIS. Our approach in national and international arbitration aims to provide clients strong advocacy, effective risk management and experience. We help our clients manage risks inherent in transacting and investing abroad by drafting effective dispute resolution agreements and structuring transactions to take full advantage of protections available under international trade and investment treaties as well as planning and managing potential future disputes particularly in project finance and energy transactions, joint ventures, technology transfers, corporate financings. In resolving both commercial and investor-state disputes, we apply our extensive experience in collecting complex evidence, analyzing applicable law and procedures, developing alternative strategies. Led by Senior Partner Prof. Dr. H. Ercüment Erdem, the experience of the senior team attracted global and local clients to rely on Erdem&Erdem for international arbitration cases. While Prof. Erdem’s reputation both as a scholar, litigator and an experienced arbitrator is widely recognized in Turkey and abroad, core members of the team, Ms. Piraye Erdem and Mr. Süleyman Sevinç both have a solid reputation in both commercial litigation and international arbitration.